Ever heard of Jim Benton? Don’t worry; most football fans haven’t. Yet the Cleveland/Los Angeles Rams star of the 1930s and 1940s still ranks #4 all time in most receiving yards in a single game. On this day 97 years ago—August 20, 1920—the National Football League was founded in that legendary Hupmobile dealership in Canton, Ohio. In 1965, the very last NFL season that would not end with the playing of a spectacular called the Super Bowl was completed. Between those two events lie the approximate number of seasons—45—that have gone down the memory hole of NFL history. But the present-day NFL emerged from stardust in 1967 when the Super Bowl was born. Prior to that, pro football was . . . misty and mostly unknowable. Primitive, prehistoric. Or so the NFL might have you believe. For some time I’ve puzzled over why pro football has a blinkered view of its own past. Then the primary reason clicked into place as I conducted an interview for my book The Cleveland Rams: The NFL Champs Who Left Too Soon. “What the NFL has done to itself,” Joe Horrigan, Executive Director of the Pro Football Hall of Fame, told me in an interview Canton in May 2015, “is to kind of mark time from when they became America’s No. 1 sport”—roughly coinciding with the creation of the grandiloquently titled Super Bowl. Imagine if Major League Baseball ignored its own early heritage. Baseball as we know it would begin roughly with Bob Gibson and the St. Louis Cardinals beating Carl Yastrzemski and the Boston Red Sox in the 1967 World Series. But Babe Ruth, Lou Gehrig, Bob Feller, Ted Williams, Willie Mays, Mickey Mantle? All largely forgotten. Taking such a small-minded stance means the NFL players and coaches of the 1920s, 1930s, and 1940s have disappeared into relative obscurity. And the 1950s and early 1960s? On a dusty shelf in the league’s back bedroom. Only with the dawning of the liberated middle ’60s and ’70s does the NFL emerge, shiny and new, TV-ready—a sport with no past. The popular perception of early pro football usually conjures images of the deadly “flying wedge” play … leather helmets … grown men missing teeth … three-yards-and-a-cloud-of-dust. Benny Friedman of the New York Giants threw four TD passes in one game in 1929. Yet the NFL’s scrum-like formative years were remarkably brief, perhaps a dozen or so in duration. 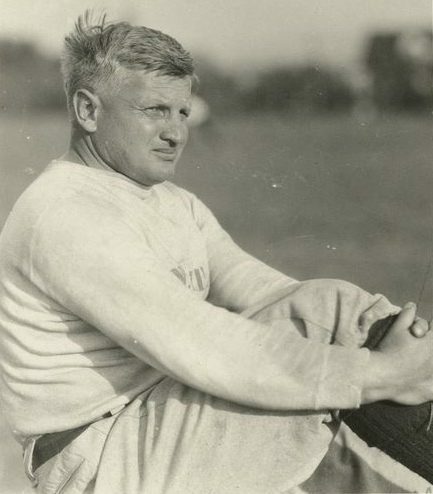 Within a decade of the league’s founding in 1920, Cleveland native Benny Friedman became a sensation by tossing 20 touchdown passes in a single season with the New York Giants, four in just one game against the Chicago Bears. But modern football as we know it—truly, the current-day NFL’s Big Bang, not the coming of TV—began in 1940 when the Chicago Bears’ deployed the T-formation offense designed by the visionary Clark Shaughnessy. Using the T, the Bears dismantled the Washington Redskins 73-0 that year in the most lopsided NFL championship game in history. Within a few years nearly every NFL team was hastily assembling some version of the T-formation. And it’s still with us today. Bob Waterfield: a prototype of the modern NFL quarterback. To watch rare footage of an NFL game from the 1940s is to witness the emergence of swaggering modern football. Cleveland/Los Angeles Rams quarterback Bob Waterfield in particular embodied the confident presence behind center, the backfield misdirections and rollouts and downfield arcs miraculously speared with acrobatic catches that we’ve come to expect from NFL football. By the time American servicemen arrived home from World War II in 1945 and 1946, “hungry for rest and relaxation and distraction” as Horrigan put it, pro football had emerged from a 25-year experiment with a product that was engineered for postwar popularity. But what of the players who brought the NFL to that magical moment? Many fans seem to see the league’s early era as a novelty and even a source of some amusement. Yet most players of the early era were not just college-educated but college graduates, usually forestalling their inevitable business or professional careers for sheer love of the game. Many were certain Americans would one day embrace the pro game as they had the collegiate version. Friedman committed suicide in 1982, in ill health and reportedly in despair that he never would be elected to the Pro Football Hall of Fame. (He finally was—in 2005.) Waterfield died a year later, his place in the Hall secure but his legend already fading. The sport’s restless forgetfulness, its disregard for its own provenance, seem to weigh a bit on Horrigan, who is charged with preserving its past. Is football history inherently just not all that interesting? Hey, I say that if the NFL can get the American public excited about its player draft, it certainly can get its fans excited about the sport’s long and glorious past. Were the Rams Locked out of a Stadium in Cleveland? 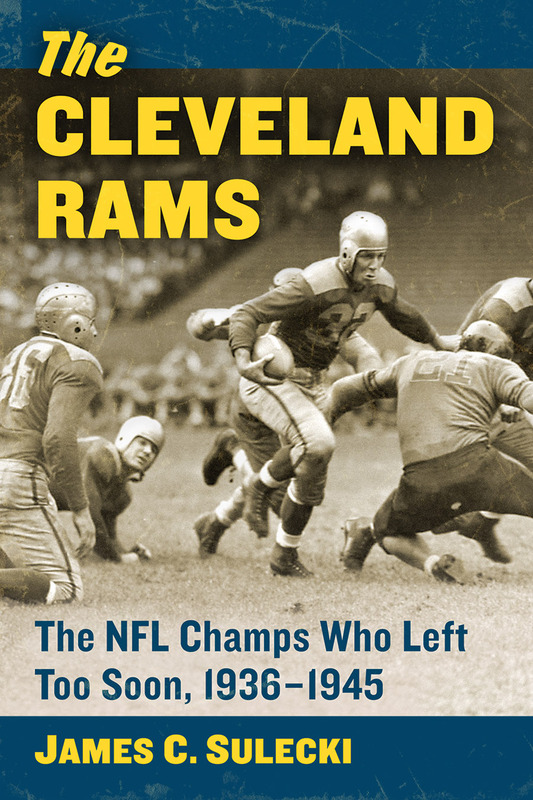 … The one thing I do know is one huge motivating factor for the Rams to move to LA in 1946 was the city of Cleveland leased out the only stadium in the city to the Browns of the AAFL [sic] and the Rams who had just won the NFL title didn’t have a place to play. How do you lockout a team that just brought a title to your city? First, I’m glad and flattered Gerald took the time to listen in on the podcast and to comment. However, a tendency to “blame the victim” seems to strike nearly every city with the misfortune of losing a major-league sports franchise, including Gerald’s own Los Angeles. … but Rams general manager Charles “Chile” Walsh, probably on orders from owner Daniel F. Reeves, signaled a wish to stay at League Park. Maybe I’m just a bit touchy on this subject. Like all native Greater Clevelanders, I watched Art Modell spirit the original Browns franchise out of Cleveland, then remain conspiratorially silent as many in the media and football fandom at large laid the blame for the move on a jilted region that had only supported the team for a half-century. So … let’s look at a few facts from 1945 and 1946. First, the Browns of the All-America Football Conference (AAFC) had no exclusive lock on Cleveland Municipal Stadium. Just like the L.A. Coliseum—which in 1946 became home to both the NFL’s Rams and the AAFC’s Dons—Cleveland Stadium was a taxpayer-owned facility. Baseball’s Indians shared it with the Browns for many years. The Rams could have used it too, if they had been interested. “I’m even willing to share the Stadium with the Rams,” said McBride. “If they want to play down there on Sunday afternoon’s [sic] we’ll be glad to play our games on Friday nights. At League Park By Choice? Were the Rams outmaneuvered by the Browns as the Stadium’s primary tenant? Sure. But they were not blocked out. 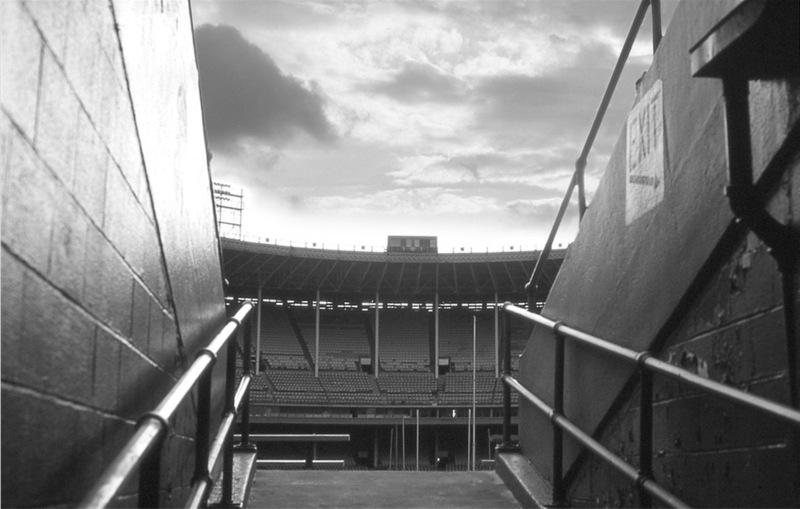 By the end of 1945 the Rams hadn’t played their regular-season schedule in Cleveland Stadium for three years. Instead they had opted for League Park, the city’s other NFL-ready stadium. 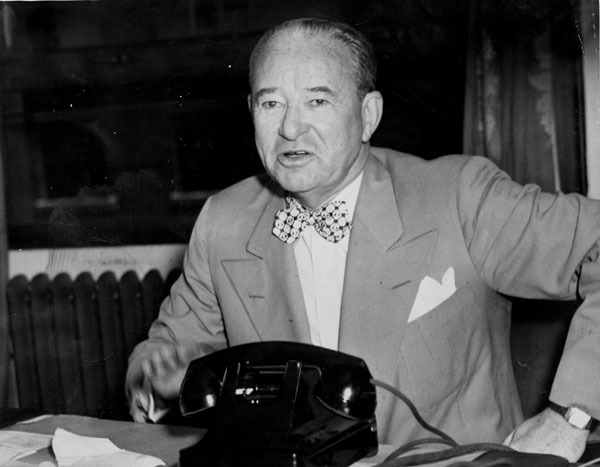 Rams general manager Charles “Chile” Walsh insisted the Rams were beholden to a lease at League Park. But in early 1945 he also had said that lease was for five years, and ten months later the Rams departed for L.A. So the lease may not have been as ironclad as Walsh portrayed it. And he was shrewd too, as was Reeves. Both were adroit businessmen who probably could have found a way to move a game from League Park to Cleveland Stadium if they really had wanted to. Perhaps playing to a very large crowd would have eroded a running argument Reeves was waging with his fellow NFL owners: that Cleveland did not support his team, and hence he needed to move. From the standpoint of public good will, it was a decisive blunder when the game with the Packers here last November—a feature that might have pulled 50,000 into Cleveland Stadium­—was crammed into League Park. I believe the confusion of that afternoon cost the Rams thousands of patrons, permanently. Instead of moving, Reeves—like Modell 50 years after him—told the media he wanted to stay where he was and fix the place up, “intimating” to the Chicago Daily Tribune in the immediate afterglow of the Rams’ championship-game victory over the Washington Redskins that he might expand League Park’s 23,000 capacity by 10,000 seats. This surely would have been problematic, however, with League Park being controlled by the Indians. So why not give the Rams access to Cleveland Stadium? The city fathers were trying to maximize payback on an expensive 15-year-old stadium that was a terrible place to watch a football game and already was beginning to look like a white elephant. So it should surprise no one that publicly owned stadiums were used as a political “football” even then. 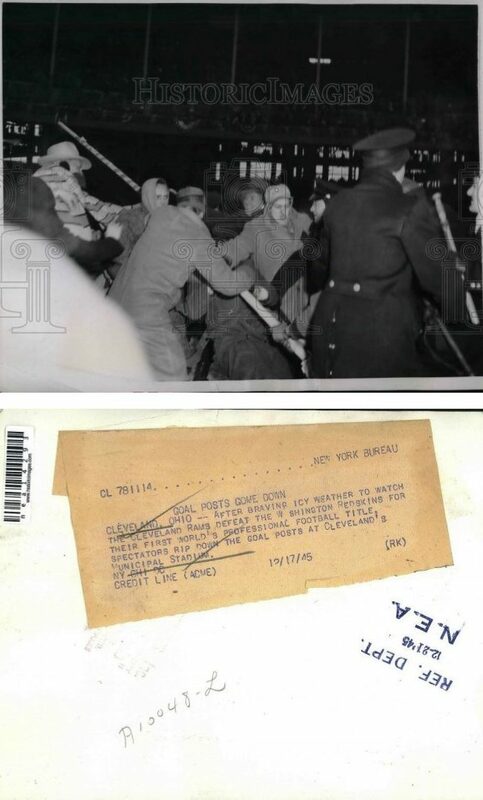 The City of Cleveland charged the Rams $10,000 to use Cleveland Stadium for the 1945 championship game (then had to make an unexpected outlay of additional labor and cost to clear the place of snow following a freak early-winter storm). This was a sweet deal for the Rams. In the 1940s the customary stadium payment in the NFL was 15 percent of the gross gate. After a take of $164,542 (which was a league record to that point), the city should have collected close to $25,000—two-and-a-half times what it actually pocketed. A few weeks later, civic officials and Rams fans in Cleveland still were not laughing when the Rams packed up and moved to the West Coast. It only goes to prove a point that apparently has been true for some time: It’s okay to accept the business and financial claims of professional sports owners at face value. Except when their lips are moving. The Rams at 80: Which Era Was the Team’s Greatest? The Brothers Walsh—head coach Adam Walsh (left) and general manager Charles “Chile” Walsh (right)—kicked off the Rams’ greatest era with a championship in Cleveland in 1945. 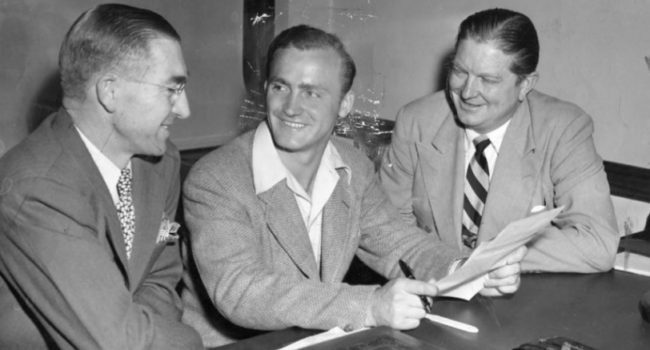 Here they’ve just signed Heisman Trophy winner Les Horvath, who ultimately would play for the Rams in Los Angeles before returning to Cleveland as a member of the Browns. We’ve just passed the 80th anniversary of the Rams’ entry into the National Football League, when on February 12, 1937, at the Sherman Hotel in Chicago the league’s owners voted to award Cleveland a franchise. 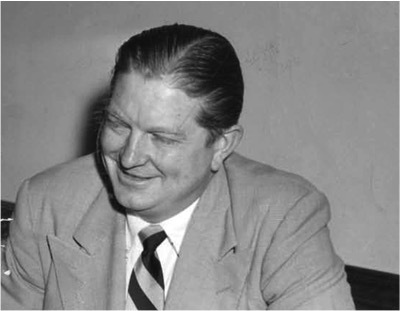 Franchise founders Homer H. Marshman and Damon “Buzz” Wetzel, along with a handful of players from the team’s sole season in the rival American Football League, picked up stakes and moved to the NFL, just to endure years of hardship on and off the field before breaking through with a championship in 1945. What was the Rams franchise’s greatest era now that we have the perspective gained from 80 years of operation? In a piece for the fan website RamsTalk.net, I assert the Rams’ final year in Cleveland before moving to Los Angeles was the springboard for the most glorious decade in the team’s long history. Read the full story at RamsTalk. Weren’t the Rams Cleveland’s First NFL Champions? It’s a question that comes up a lot: Weren’t the Rams Cleveland’s first NFL champions, and the Browns the city’s second? So, who was this team that preceded both the Rams and the Browns as Cleveland champions? It was none other than the Cleveland Bulldogs. In 1924, in only the fifth regular season of an organization that was fresh off a name change from the American Professional Football Association to the National Football League, the Bulldogs (7-1-1, .875) picked up one more win than had the Chicago Bears (6-1-4, .857) and laid claim to the pennant. 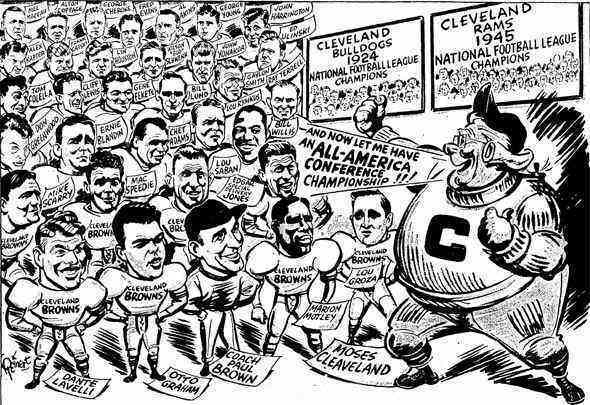 A Cleveland Plain Dealer cartoon on the eve of the Browns’ first All-America Football Conference title game in 1946 bears witness to the NFL champions who preceded them: the 1924 Bulldogs and 1945 Rams. And here’s where controversy erupted. Because the Bulldogs had edged Chicago 16-14 in an early-season match-up at Dunn Field (later League Park), the Bears challenged Cleveland to a December 7 rematch at Wrigley Field and thrashed the Bulldogs soundly, 23-0, thinking they had made their case for dominance of the league. No dice, NFL officials said at their annual meeting in January 1925. The regular season had ended November 30. Therefore, any game played after that qualified as merely an exhibition. The Bulldogs were champions; the Bears were livid. But, weren’t the legendary Bulldogs—also champions the previous two NFL seasons—actually from Canton? They were. But by 1924 they were so financially strapped in the future Pro Football Hall of Fame city 60 miles south of Cleveland that the organization took to canvassing the city trying to sell season tickets, to little avail. So Samuel H. Deutsch, owner of a rival NFL team called the Cleveland Indians, bought the Bulldogs and combined the best players from his 1923 Indians with the best of the Bulldogs to create the 1924 NFL champions in Cleveland. In 1925 the franchise splintered again, with several Canton businessmen buying back the rights to the Bulldogs from Deutsch and playing games in Canton, while Deutsch continued to call his Cleveland team the Bulldogs. This is critical. Had the Bulldogs moved lock, stock, and barrel from Canton to Cleveland in 1924 after their 1923 title—or from Cleveland back to Canton in 1925 after their 1924 title—they would have become the first NFL champs to play elsewhere the next year. But they didn’t, and as a result, two decades later when the 1945 Cleveland Rams became the 1946 Los Angeles Rams, they became the first—and to this day only—NFL champions to play the following season fully intact in a completely different city. * As I say, Cleveland is the only city to win NFL championships with three different franchises. Checking in with two titles each are Baltimore (Colts, Ravens) as well three major metropolises that at various times were home to two franchises simultaneously: Chicago (Bears, Cardinals), Los Angeles (Rams, Raiders), and New York (Giants, Jets). Did the AAFC Try to Block the Rams’ Move to the Coliseum? The minutes of a meeting of the Los Angeles Coliseum Commission in January 1946 capture an attempt by the AAFC’s Los Angeles Dons’ to undermine the Rams’ arrival in L.A.
It’s well documented—in the book The Cleveland Rams and elsewhere—that the intense rivalry between the established NFL and the brand-new All-America Football Conference was a key factor in the Cleveland Rams moving west to become the Los Angeles Rams. For one, the AAFC’s Browns were encroaching on the Rams’ Cleveland market just as the latter had won a championship. For another, the flag the AAFC was about to plant in both L.A. with the Dons and San Francisco with the 49ers gave NFL owners added urgency to approve Daniel F. Reeves’s proposed move west and establish their own foothold in booming postwar California. But what isn’t always so well known is how nasty the NFL–AAFC rivalry could get. This is revealed, for example, in a little-seen document posted this weekend by the Los Angeles Times: minutes from a meeting of the Los Angeles Coliseum Commission on January 29, 1946, only 16 days after Reeves had announced he was moving the Rams west. To set the stage: Vying for use of the Coliseum—off limits to pro football for two decades—are the Rams’ Charles “Chile” Walsh, and the Dons’ Slip Madigan and Al Wesson. In time, both teams would be granted access to the publicly owned facility, with the Rams doing so by signing African American players Kenny Washington and Woody Strode and thereby igniting the reintegration of the NFL. Not if the Dons had had their way, however. Wesson in particular attempted to undermine the Rams’ reputation and with it the West Coast city’s eagerness to accommodate the inbound NFL champions. In fact, throughout the proceedings he insisted on hopefully calling the team the “Cleveland” Rams, even though all others already had taken to calling them the “Los Angeles” Rams. This is true. Reeves and Walsh absolutely longed for the 103,000-seat Coliseum, but if need be they were fully prepared to play in L.A.’s Wrigley Field (capacity 21,850) or Gilmore Stadium (18,000). Which also was true. The season of 1945 brought the Rams their first-ever winning record. This is only partially true. It could be argued that the seasons of 1942, 1943, and 1944—during which the perennially powerful Washington Redskins, Chicago Bears, and Green Bay Packers won championships—were the lowest wartime ebb of football. By May 1945 the Allied Powers had won the war in Europe; by August, World War II was over, and many players already had received honorable discharges and were stateside by the time the 1945 season began in September. It actually was even worse: The Rams finished fourth four times and fifth twice. But about the future, Wesson was decidedly wrong. The Rams were about to embark on the most successful stretch in their history by posting 10 consecutive winning seasons and playing in four NFL championship games, winning one. Generally true. And the Rams would continue to lose even bigger gobs of money in Los Angeles—but only until the early 1950s, when surpluses began to roll in in ever-increasing sizes. So who was this Al Wesson, who had argued so vigorously, and unsuccessfully, to keep the Rams out of the Coliseum? Turns out he held a disappointingly small “one-half of one percent” of the Dons—a team that would be thwarted in its own four-time quest for an AAFC championship by the dynastic Browns. And naturally, as evident by Wesson’s persuasiveness, he was a publicist for Hollywood Park—now the forthcoming site, in one final posthumous insult, of a brand-new stadium for … yes, the Los Angeles Rams. Are the 1937 Rams the All-Time Losingest NFL Team in Cleveland? Until 2016, the answer would have been yes. In 1937 the debut edition of the Cleveland Rams and their 0–10 (.090) record put in a performance of on-field futility that surpassed even the inaugural Cleveland Browns II of 1999 (2–14, .125). And then along came the Browns of 2016 and their 1–15 (.067) record. 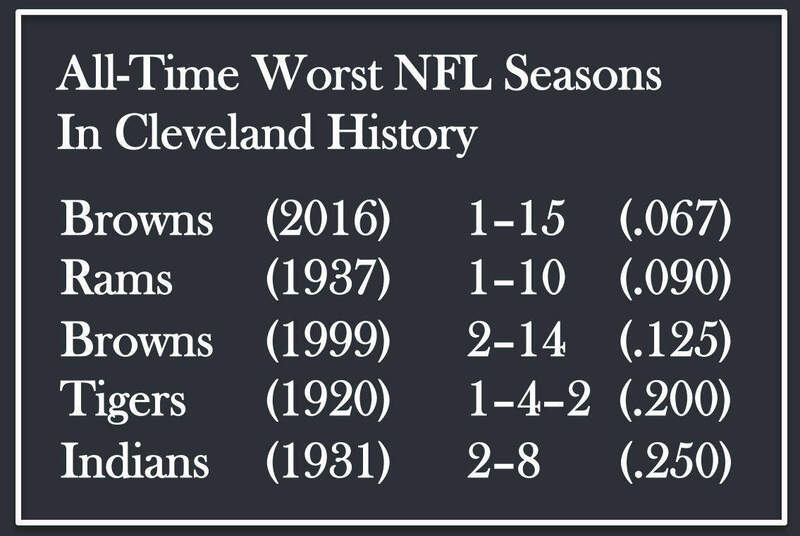 Yes, Cleveland football fans—not just Browns fans but fans of all Cleveland NFL teams through the decades—have never seen an NFL season more awful than the one they’ve just witnessed. And that’s saying a lot. You see, Cleveland was a charter member of the American Professional Football Association (APFA) all the way back in 1920—just shy of a century ago. We now know the APFA as the National Football League, born of man in that famous manger Hupmobile dealership in Canton, Ohio; and believe it or not, it actually took some time for NFL football to take hold in what was then baseball- and boxing- and college-football-mad Cleveland. Hugo Bezdek was a fantastic Major League Baseball manager and college football coach, but as the head coach of the 1937-1938 Cleveland Rams he was an abject failure. He was fired after compiling a 1–13 record and never coached pro football again. Three NFL teams predate the Rams and the Browns in Cleveland: an NFL charter franchise called first the Tigers then the Indians in 1920 and 1921; a Canton Bulldogs / Cleveland Indians blend (1923-1927) newly christened the Cleveland Bulldogs in time to become NFL champs in 1924; then, for one single season that was underwritten by the league in hopes of getting something started in Cleveland, a second version of the Indians. But that team was was disbanded after compiling a 2-10 record, thereby qualifying it for fifth on Cleveland’s all-time infamy list. In terms of losing percentages the 2016 Browns have beaten ’em all—the debut rosters of four different expansion teams included. Optimistic Browns fans might choose to derive some hope from the Rams’ rags-to-riches story. And it is indeed true that after cycling through four head coaches and turning over their entire roster between 1937 and 1944, the Rams dove deep into the 1944 NFL draft and selected, with the 42nd overall pick, a dark-horse quarterback out of UCLA who hadn’t even earned All-American status. The very next season, 1945, Bob Waterfield passed the Rams to a 9–1 record and the NFL championship. The Browns can only hope the 2017 player draft in April brings much the same result. They currently hold the number-one pick.